Sensonics, the condition monitoring specialists, have introduced a new range of proximity sensors suitable for measuring shaft vibration, position and speed on rotating plant. Built on their established Senturion proximity probe range, the new series offers a configurable universal driver suitable for all probe cable combinations and offers new features including a separate socket for gap voltage monitoring. Proximity probe systems are made up of a calibrated probe, extension cable and driver. Utilising the eddy current principle, this combination forms a tuned circuit with the target material and variations in probe face to target distance are detected in this circuit by the driver. This provides a linearized voltage output proportional to target gap with a nominal sensitivity of 7.87mV/um. This type of measurement system provides highly accurate (resolution typically less than one micro-meter) vibration and relative positional measurements, for harsh environments up to 180°C. 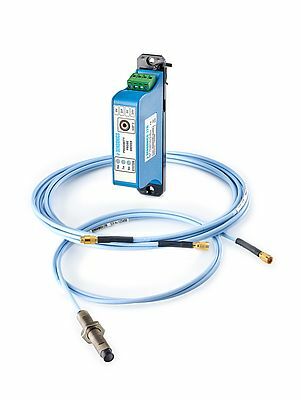 The new probe range from Sensonics offers several improvements including:- · Switch selectable system cable lengths 5m, 7m and 9m. · LED indication of selected length. · 3.5mm socket for gap voltage monitoring. · Double screened cable for high noise immunity. · Snap lock and shake proof cable connection. · Low profile driver for easy local integration to machine (Din rail mount opt). · Excellent repeatability on replacement of either probe, extension or driver. The driver unit offers selectable system lengths of 5m, 7m or 9m, with a front panel green LED indicating the selected option. This provides flexibility on-site when installing the system, where in most cases different system lengths are required on the various machine locations, with the additional benefit of minimising the spares holding. The gap voltage monitoring socket assists with commissioning the probe system; a volt meter can be connected directly to the driver through the 3.5mm standard audio socket to display the gap voltage at the point of installation and the probe mechanical gap can then be adjusted to suite the application. The cable system incorporates snap lock connectors which require no torqueing and provide a shake proof solution important for heavy industrial applications. The double screened cable offers robustness in combination with high immunity to interference and optional stainless steel convoluted armour is available for applications or environments where cable protection is paramount. The universal driver concept follows on from other universal hardware platforms developed by Sensonics, such as the Sentry G3 monitoring and protection system which offers a single hardware platform for all the necessary turbine and pump vibration and supervisory measurements. Reducing spares holding and field upgradability is a key advantage of adopting this latest generation of equipment.